Our dwellers are explorers - strangers in a strange land. When Hótel Egilsen opens up it´s door these strangers will feel at home in the relaxed and easy going atmosphere making them feel among friends, mingling with the natives, swapping stories, talking about life and planning new adventures. Hotel Egilsen is one of the few historic hotels in Iceland and the building itself is protected by the nations cultural heritage act. It was built in 1867 by an influential man at that time named Egill Egilsson and hence the name, Egilsen House has stuck with it ever since. Our guests have the history of the building as a backdrop and have the opportunity to create their own history based on experiences and share it with us by leaving behind a story that is published on our website. Iceland is a nation of storytellers and since the first settlers arrived in the late eight century storytelling has always been important to us. 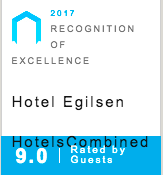 We at Hotel Egilsen carry on this heritage and it is a well-known secret that Hótel Egilsen values a good story as much as it values its sparkling dinnerware. Therefore we encourage our guests to leave us a story and get a discount on their stay. It is our hope that these narrations may continue to live in the memories of our guests long after their return home. You can read our guests stories here. This is where heart of the hotel beats, in our small lounge on the first floor where our guests are warmly greeted as they enter the hotel. This is also where one can relax with a drink, have a chat with the staff and other guests or browse our small library to enjoy a good book. In the mornings we serve our delicious breakfast there as well. Our rooms are small but they are bright and comfortable. Each room has a private bathroom with overhead power shower, iPad, and the all natural COCO-MAT beds. They are made from natural matrials from renewable sources such as coco fibre, natural rubber, wool, cotton, sea grass, horsehair, silk linen, wood and goose down. We chose COCO-MAT because we want our guests to have a good night sleep while staying with us. the spirit of this 150 year old house. Relax at the bar after a day of exploring and share your stories with our staff or other guests. We serve among others Icelandic beer and delicious cocktails made by our bar tender. In winters we serve a variety of warm drinks. Browse through our small library of books while you enjoy your drink. You might get inspired to write a story of your own to share with others on this website. It´s also possible to swap one of your books with one of ours but make sure to ask our staff first which ones are available for that. Enjoy our fresh, home made and delicious breakfast in our lounge. We have eggs, Icelandic salmon, granola, yogurt and freshly made smoothie to mention a few. Of course there´s fresh coffee and a variety of tea to choose from.